Two people were injured in a Valley Glen carport fire on Thursday, June 30, 2016, according to the Los Angeles Fire Department. 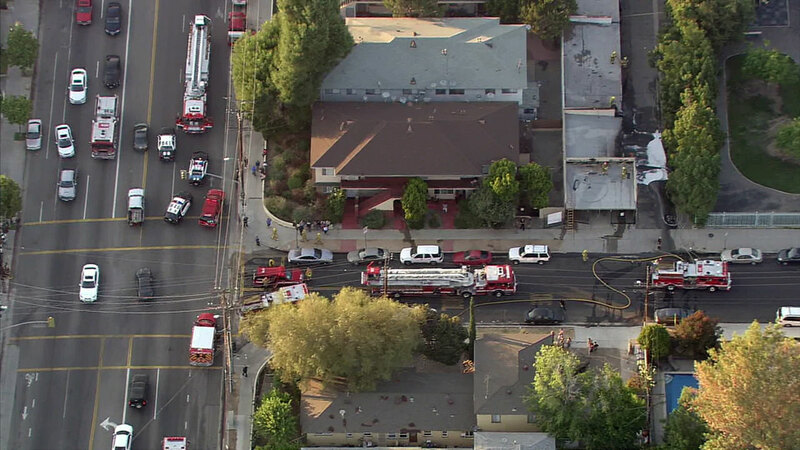 LOS ANGELES, CA -- An argument lead to one man dousing another man in gasoline and setting him on fire in a carport Thursday evening, according to Los Angeles police. Police said the two men, one sitting in a car and the other outside the vehicle, were arguing in the carport in the 6600 block of Woodman Avenue at about 7 p.m.
That's when detectives said the man outside the vehicle doused the man inside the car with gasoline and set him on fire. The car and the carport went up in flames, injuring both men. Officials said the man inside the car suffered critical injuries, while man outside the vehicle suffered serious injuries. The men, both in their mid 20s, were rushed to the hospital. It took 14 minutes for 37 firefighters to knockdown the fire, the Los Angeles Fire Department stated. Officials said firefighters kept the flames from spreading to nearby apartments. Both police and fire officials were investigating the incident.